Kangra which was known anciently as ‘Trigarta’ is one of the most picturesque valleys in Himachal Pradesh. 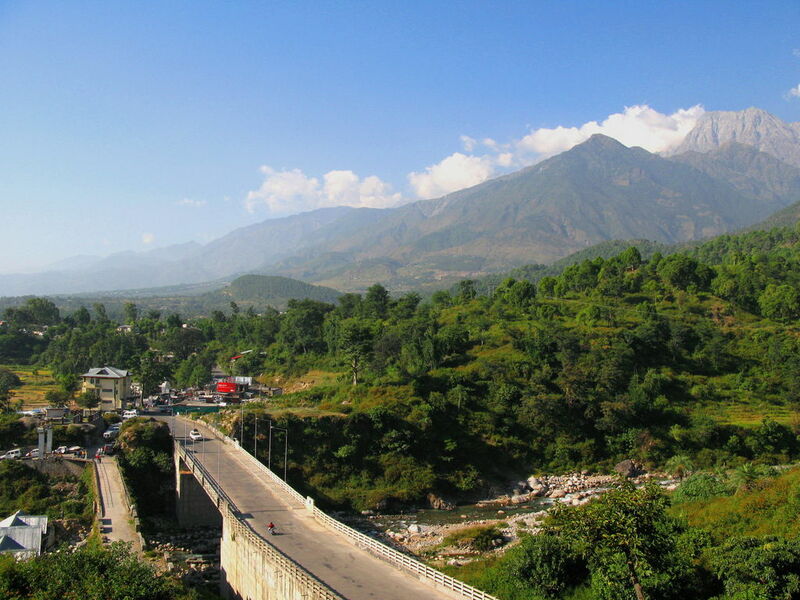 It is sheltered by the massive Dhauladhar range of mountains, rich in culture and history. The history of Kangra valley dates back to vedic times, more than 3,500 years ago. It finds mention in the ‘Puranas’ the Mahabharta and in Rajtarangani. Kangra valley is one of the most picturesque valleys in the Himalayas. It is sheltered by the Dhauladhar and this majestic mountain range surpasses all others in its grandeur. the history of Kangra dates back to the Vedic times more than 3,500 years ago. 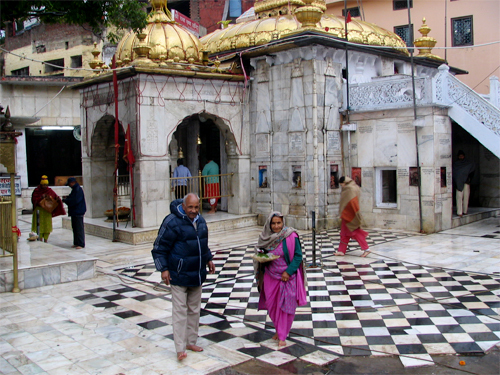 The famous ‘Bajeshwari Devi’ temple is located in the town. Kangra was ravaged by foreign aggression a number of times. Despite all this, the arts and crafts of the region continues to develop and find lyrical expression. Kangra town is situated at the confluence of the Baner and Majhi streams, overlooking the Banganga torrent is famous for temples, forts and now a speedily emerging as a business centre. The district lies between 31°40′ and 32°25′ East Longitudes and 70°35′ and 77°05′ North Latitudes. It is bounded on the South-West by Una district, on the North-West by district Gurdaspur of Punjab, on the North by Lahaul-Spiti and Chamba districts, on the East by Kullu and Mandi districts, and on the South it touches Hamirpur district. Tourism in Kangra offers a great escape to the world famous temples and beautiful lakes. 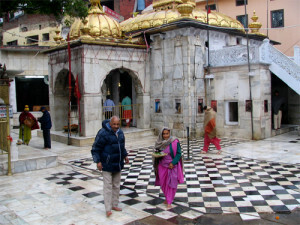 Tourism in Kangra offers world famous temples i.e. Baijnath, Jawalamukhi, Bajreshwari Devi Temple, Chamunda Devi Temple, Masroor Rock Temple, Chinmaya Tapovan, Kathgarh Temple and Trilokpur Temple. Tourism in Kangra is ideally suited to religious minded people who wish to visit the abode of gods known as Himachal. Baijnath, Jwalamukhi and Chamunda Devi temples attract uncountable number of visitors all from all around India as well as foreigner tourists. Tourism in Kangra also offers world famous Maharana Pratap Sagar Lake ( once known as Pong Dam ) which offers tourists a number of water sports activities i.e. boating, angling and fishing, bird watching etc. It is also a wild life sanctuary and so the possibilities of spending creative and quality time here are enormous. Tourism in Kangra also offers tourists a very different kind of experience with its world famous areas i.e. Dharamsala and Palampur. Dharamshala is a paradise for tourists and Palampur offers breath taking view of Dhauladhar and thrilling experience of para-gliding. 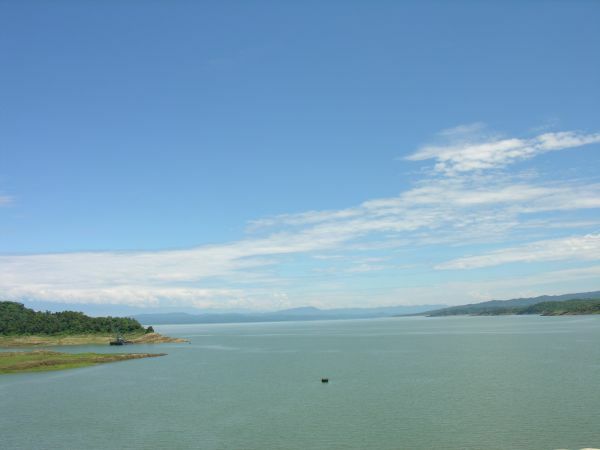 Maharana Pratap Sagar Lake : It is made of Beas River. In 1960, a dam was built on the Beas river and this dam resulted in a huge Maharana Pratap Sagar Lake (once known as Pong Lake). This huge mass of water varies from 180 sq. km. to 400 sq. km. In 1983, the Sagar was declared a wildlife sanctuary and over 220 species of birds belonging to 54 families have been sighted over the waters and the fringing mud-banks – these include black-headed gulls, plovers, terns, ducks, water-fowl and egrets. The land portion of the sanctuary has barking deer, sambar, wild boars, nilgai, leopards and claw-less otters. 27 species and sub-species of fish belonging to six families have been recorded in the Sagar’s waters. Chamunda Devi Temple : It is 15 km. from Kangra. This temple is situated on the right bank of the ‘Baner’ stream with the Dhauladhar as a backdrop, this has an idol of goddess Chamunda, who, it is said, was given the boon to fulfill the desires of those who worshiped her. On the back of the temple is a cave niche where a stone ‘Lingam’ under a boulder represents Nandi Keshwar ( Shiva ). 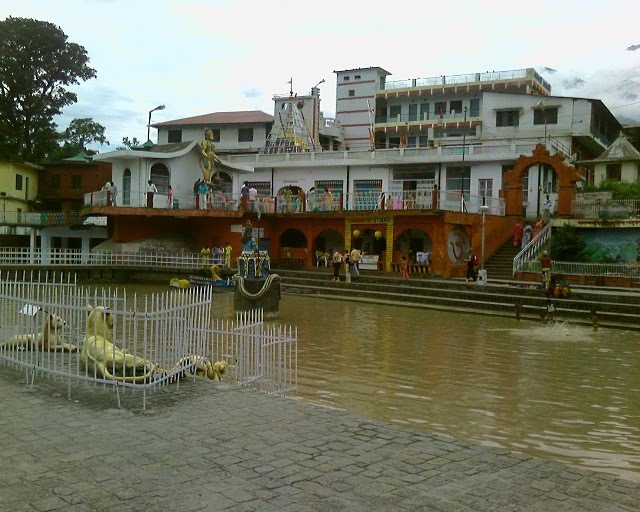 Kangra Town: At the confluence of the Bener and Majhi streams , over looking the Ban Ganga torrent, Kangra town is famous for its temples.Notable is the shrine dedicated to goddess Brijeshwari. Kangra is steeped in history and its ruined fort – Nagarkot, stands as testimony to its glorious past. The town was attacked by Mohammed Ghaznavi and subjugated by Emperor Feroz Tuglak and Maharaja Rant Singh. Earlier, Kangra was the capital of the great hill state, its renowned ruler being Maharaja Sansar Chand Katoch, a great patron of arts. The Miniature and Rajpur Schools of hill paintings flourished during his reign. Jwalamukhi : 30 kms from Kangra and 56 km. from Dharamshala. This place is famous for Jwalamukhi, the ‘Flamming Goddess’, jawlaji, It is one of the most popular Hindu temple in Northern India. There is no idol and the flame is considered a manifestation of the Goddess. The eternal flame issues from the rock sanctum and is constantly fed by the priests. Two important fairs are held during the Navratras, in early April and in mid October. Brajeshwari Devi Temple : Just outside the town is the temple dedicated to Brajeshwari Devi. Known once for its legendary wealth, this temple was subject to successive depredation by invaders from the North. Mohammed of Ghazni is known to have departed with a king’s ransom in gold, silver and jewels in 1009. Destroyed completely in 1905 by an earthquake, it was rebuilt in 1920. Masroor Rock Temple : 40 kms from Kangra. Masroor is known for its monolithic temples. 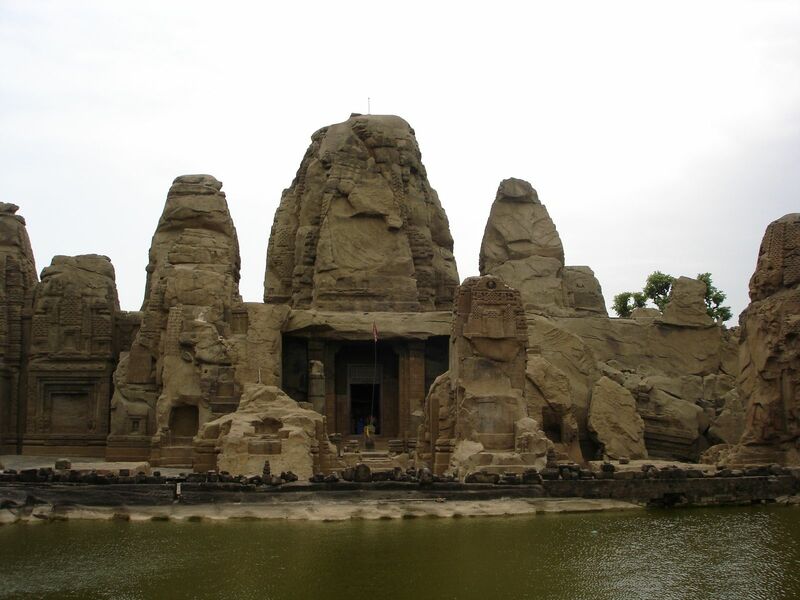 There are 15 monolithic rock-cut temples in the Indo-Aryan style, richly carved. The temples, partly ruined now, are profusely decorated with sculptural ornamentation conceived in the same manner as the great temple of Kailash at Ellora in Maharashtra. The main shrine contains three stone images of Ram, Lakshman and Sita. 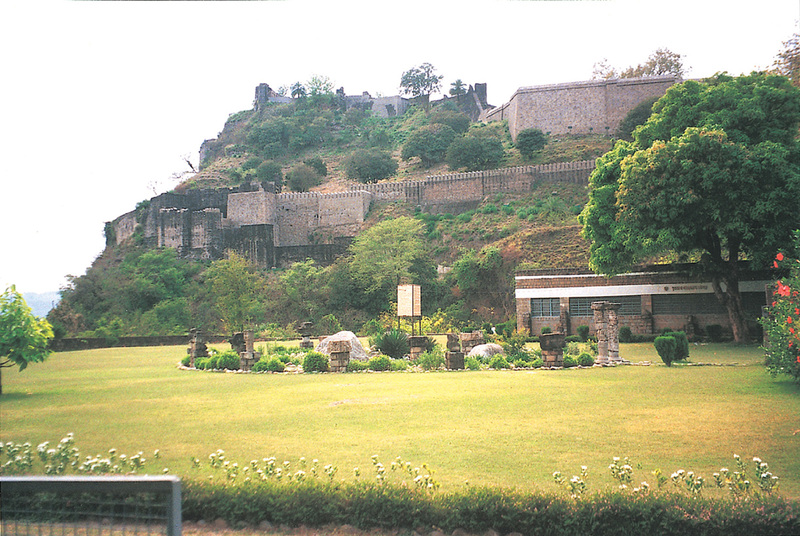 Kangra Fort : The historic fort of Kangra was built by Bhuma Chand. This fort had been the centre of attraction for the rulers of northern India, since a long time. The first attack on the fort was made by the Raja of Kashmir ‘Shreshtha’ in 470 A.D. 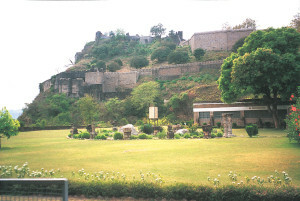 In 1846 Kangra fort fell into the hands of the British. Kangra fort is located on the bank of the river Banganga at the height of 350 feet. In the foreyard of the fort are the temple of ‘Laxmi Narayan’ and ‘Adinath’ located in the Kangra fort is dedicated to Jainism. Inside the fort are two ponds one of them is called ‘Kapur Sagar’. At present the fort is under the control of ‘Archaeological Survey of India’. It was badly damaged in 1905 earthquake. Taragarh Palace : Muslims used this place to propagate the ideas of Islam and in 1933 the ‘Nawab of Bhavalpur’ built a palace there, which was named as Alhilal. Till 1947, the place remained as the Summer capital of the Nawab. From 1947-49 it was used as warehouse by the Punjab government. In 1949 it came in the possession of ‘Maharani Tara’ the wife of Maharaja Hari Singh of Jammu and mother of Raja Karan Singh. In 1951 it was converted into a Motel Taragarh Palace. Pong Lake Sanctuary : In 1983, the Sagar was declared a wildlife sanctuary and over 220 species of birds belonging to 54 families have been sighted over the waters and the fringing mud-banks – these include black-headed gulls, plovers, terns, ducks, water-fowl and egrets. Maharana Pratap Sagar Lake is the only place in India other than Bharatpur (Rajasthan) where the rare red necked grabe has been found. 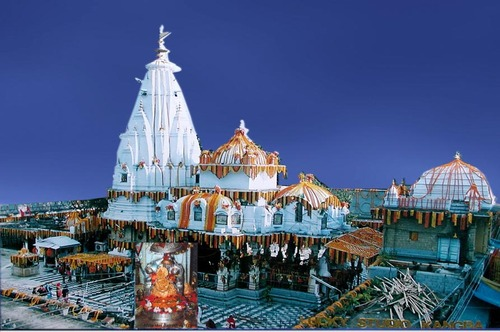 The sanctuary is close to several places of Hindu Pilgrimage – Jawalamukhi, Chamunda Devi, Chintpurni, Brajeshwari Devi, Mahakalesar, Bagalamata and Naina Devi. The seat of His Holiness the Dalai Lama at Mcleodganj and the Namgyal Monastery are a short drive away. The other budhist monasteries at hand are Tahijong and Bir. Chinmaya Tapovana : 10 km. from Knagra. Situated on a hillock is the recently established ‘Ashram’ complex by Swami Chinmayananda, who was a great exponent of the Gita. It is a beautiful place to visit. There is also a larger than life statue of Hanuman and also a very big Shivling which can be seen from far. Kangra Art Museum : This art museum displays arts and crafts of Kangra Valley which date back to 5th century AD. It includes a paintings, pottery, sculptures and anthropological items. You can also see on display dresses worn by royalty and local people. 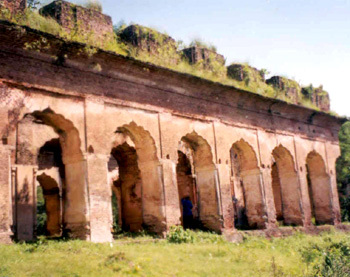 Sujanpur Tira : The historic town of Sujanpur Tira is known for its palace, now in ruins, built by Raja Sansar Chand. It is famous for the temples of Gauri Shankar, Murli Manohar and Narbadeshwar. 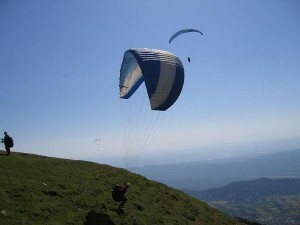 There is the largest ground of Himachal Pradesh which is made use of as a meeting place and also for sports activities. Bir & Billing : Bir enclosed with tea gardens and an amphitheater of low hills, is an ideal landing around for para-gliders. Bir has Buddhist Monasteries that are worth visiting. Fine Tibetan handicrafts are also produced here. Billing, up in the hills 14 kms. from Bir with an arena of 200 kms. for high altitude and cross country flying, is one of the great aero sports sites in the country. Kathgarh : It is a village situated 7 kms. from Indora on the meeting point of the Beas and the Choch rivers. There is an old temple, built in Mughal style, housing 6 feet long and 5 feet round ‘Shivalinga’ The ‘Linga’ here is of its own kind not found anywhere in the world. Gopalpur Zoo : was established by the Himachal Pradesh Govt and located on the Dharamshala-Palampur road. Animals like Asiatic Lion, red fox, Himalayan black bear, Sambar, hog deer, Leopard, barking deer, angora rabbits can be seen here. Nadaun : 10 km. from Jwalamukhi and 40 km. from Kangra. A lovely place for a quiet weekend. The Beas river which flows nearby provides excellent Mahasheer fishing. Theere is a temple dedicated to Shiva. Trilokpur : It is 41 km. from Kangra. The natural cave has attractive pillars of limestone on the floor of the cave by the percolation of water from the roof. It is something like stalagmites. The cave is dedicated to Shiva. Baisakhi Fair : This fair is held at various places in the state. People carry village deity with music procession from one place to another. In upper hills, people perform ‘Mala Dance’ by joining hands to form a large circle. During day time, some games like archery and wrestling are also played. Jwalamukhi Fair : The Jwalamukhi fair is held twice a year during Navratras for worship of Durga goddess. It is the most imporatant fair in the Kangra valley. People come with red silken flags (dhwaja) to greet the Mother Goddess. The fair is attributed to the worship of that Eternal Flame which is coming out of earth spontaneously and perpetually. Dal Fair : It is held on the bank of lake Dal, in the month of August in district Kangra at Dharamshala. Held sacred, this has a small Shiva temple on its banks. The banks of the lake are enlivened every September by a fair attended – amongst others- by a large number of migrant Gaddi folk. Sayar Fair : It is a famous fair observed in the month of September at a number of places such as Bakloh in Kangra, Karsog in Mandi, and Subathu in Shimla. There are not too many accommodation options available in Kangra. However, there are plenty of options in Dhramasala. 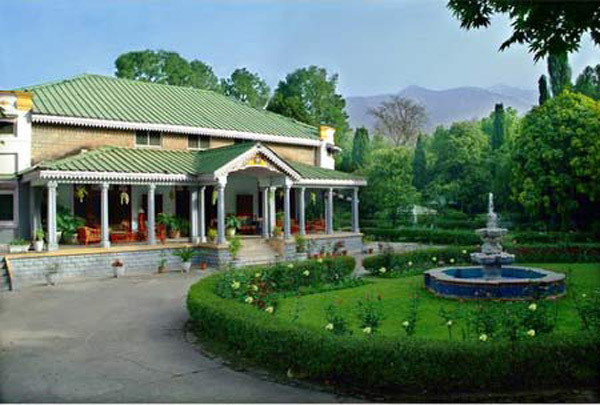 Judge’s Court and Taragarh Palace of Welcome Heritage Group are luxury hotels in Kangra. 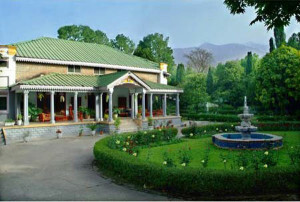 Best Western Hotel, Anand Palace is a 3 star hotel in Kangra, City Center. Air Route : The nearest Airport is at Gaggal, 13 Kms from Dharamshala and 8 Kms from Kangra Town. Train Route : The nearest railway station is at Kangra, 17 KMs from Dharamshala connected to Pathankot through narrow gauge line. And the nearest broad gauge railway station is Pathankot which about 88 Km from Dharamshala, which is linked by direct trains to Amritsar, Delhi, Bombay and Calcutta. Regular bus service is available from Pathankot to Kangra. any other kind of transportation is easily available. By road : Kangra offers wide network of roads. Dharamshala is 17 km from Kangra and Delhi is about 500km from Kangra.